Did the Egyptian Goddess Hathor Originate in Canaan? Hathor was goddess to Egyptian pharaohs, and to Semitic turquoise miners in the Sinai, who came from Canaan. But who had her first, archaeologists wonder. that hall of travelling through the marshes. The goddess Hathor is considered central to the Egyptian pantheon. Personifying female aspects of love, music, fertility, and more Hathor was the deity responsible for welcoming the ancients to the afterlife, and an object of worship specifically to miners. But was she actually Egyptian? From 1967 to 1982, when the Sinai was controlled by Israel, numerous excavations took place in what most consider to be desert wasteland, habitable mainly by desert fauna, Bedouins, and terrorists. The archaeological evidence found offers a different picture, one of settlements, commerce and turquoise mining, going back to prehistory. Turquoise mining in the Sinai stretches back over 6,000 years to the Chalcolithic period, the 4th millennium B.C.E. It was carried out exclusively by nomadic Semitic people, who exported the mineral to Egypt. However, in the Third Dynasty, around 2600 B.C.E., the Egyptians took over mining operations themselves, as Dr. Itzhaq Beit-Arieh of Tel Aviv University deduced in 1984. It was in the Twelfth Dynasty (1991-1186 B.C.E.) 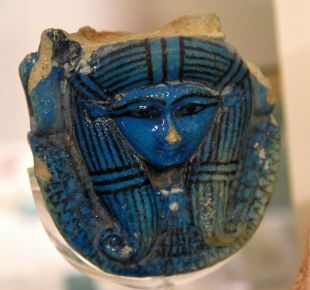 that the Egyptians moved their mining operations to the turquoise-rich veins of Serabit el-Khadem in the west-central Sinai, and built a temple dedicated to Hathor, the "Lady of Turquoise," on a mountain plateau. The original shrine to Hathor was in a cave: the portico was built in front of the cave and the temple in front of the portico. 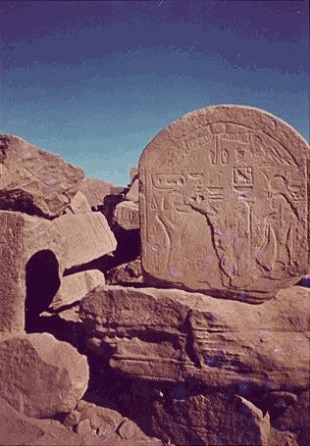 Beit-Arieh believed that each successive mining expedition rebuilt and added new chambers and hieroglyphics to the temple, up to the Twenty-Sixth Dynasty (685 to 525 B.C.E.). The question is how Hathor got there. 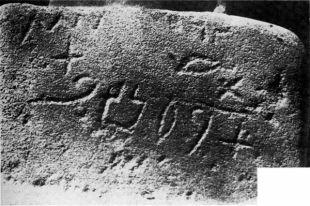 One of the most interesting finds at Serabit el-Khadem was what has been labeled proto-Sinatic inscriptions. The first inscription was discovered in 1869 by English explorer and Orientalist E.H. Palmer and ten more were found in the temple area by Egyptologists Hilda and Flinders Petrie. 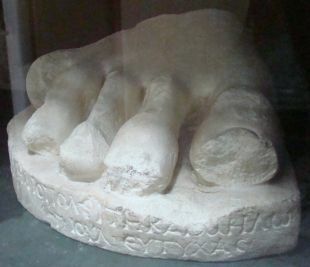 According to Beit-Arieh, these inscriptions, carved sometime in the late 16th to early 15th centuries B.C.E. (Late Bronze Age), derived under hieroglyphic influence, represent the earliest known form of the Semitic alphabet. Scholars still argue over to what the inscriptions actually say. Sir Alan Gardiner, a British Egyptologist and linguist, for one, translated the word ‘I- ‘Ba-al-at’ to mean ‘To Baalat’. If he is right, it would confirm the presence of Semitic people, probably continuing their work as miners as they had done from the Chalcolithic period through the Early Bronze Age (3150-2200 B.C.E.) into the Middle Bronze Age (2200-1500 B.C.E. ), corresponding with the early part of the Egyptian’s Twelfth Dynasty. This inscription leads many scholars to argue that Hathor was not originally an Egyptian deity, but a Semitic goddess who was Egyptianized. Beit-Arieh cautioned however that we cannot assume the people mining in the Chalcolithic period were the same as those working in the mines in the Early Bronze Age, or that those working then were the same as the people working under the Egyptians. 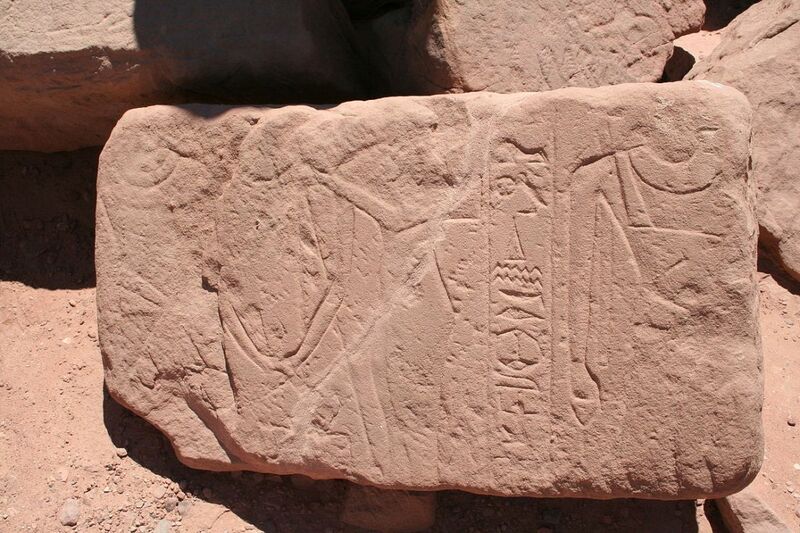 Some thought the argument had been put to rest when three reliefs discovered at Serabit el-Khadem depicting Hathor in her Egyptian form of a cow were discovered by Professor Raphael Giveon, Egyptologist at Tel Aviv University. Some scholars, including Beit-Arieh, concluded that at the site, Hathor was not being worshipped as a Semitic goddess, but as an Egyptian one. 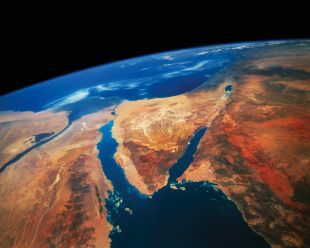 However, the presence of Semitic peoples as turquoise miners in the Sinai over 4,000 years ago, plus the evidence of trade connections between the Semitic miners and Egypt going back millennia, plus the inscription, suggest that Hathor found her way to Egypt as Baalat sometime in the second millennium B.C.E. This suggests that at least the original shrine to Hathor in the Sinai, and possibly the later temple, were most likely built by, and for, the local workers, who brought the goddess with them to Egypt.